A UK-wide study of pregnancy-related deaths in women has found that while overall numbers are falling, some women could receive better care, particularly in relation to their mental health. The UK Confidential Enquiry into Maternal Deaths, which has been running for 60 years, collects statistics and information about all deaths of women in pregnancy, during birth, and up to one year after birth where the death is pregnancy-related. The report, Saving lives, Improving Mothers' Care, is the latest analysis from the MBRRACE-UK Confidential Enquiry into Maternal Deaths, based at the University of Oxford. 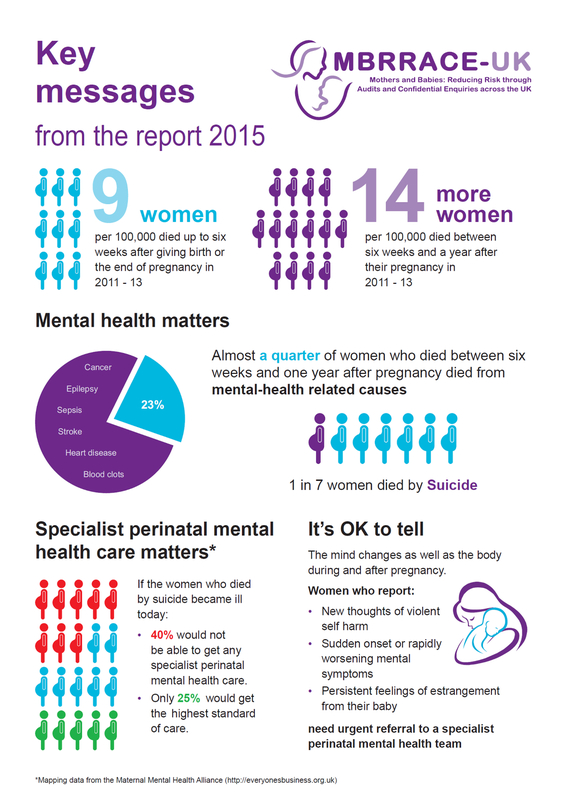 The report focussed particularly on maternal mental health, and includes lessons learned from reviews of the care of more than 100 women who died by suicide during pregnancy or in the year after giving birth between 2009 and 2013. One in eleven of the women who died during or up to six weeks after pregnancy died from mental health-related causes. However, almost a quarter of maternal deaths between six weeks and a year after birth are related to mental health problems, and one in seven of the women who died in this period died by suicide. There were 69 deaths from direct causes – pregnancy complications – a number which has been falling steadily. Conversely, 'indirect deaths' – those due to medical and mental health problems - have not fallen significantly. The number and rate of indirect deaths have not shown the same year-on-year decline. For the three-year period 2011-2013, there were 145 indirect deaths. Overall, this is equivalent to nine direct and indirect deaths per 100,000 pregnancies, down from 10 in the previous three-year period. There are clear opportunities for improving mental healthcare for women during and after pregnancy. Specialist perinatal mental health care is particularly important. Professor Marian Knight, who led the work, said: 'This analysis has shown that there are clear opportunities for improving mental healthcare for women during and after pregnancy. Specialist perinatal mental health care is particularly important. Although severe maternal mental illness is uncommon, it can develop very quickly in women after birth and the woman, her family and mainstream mental health services may not recognise this or move fast enough to take action. A pattern of declining mental health may not be identified as women are seen by doctors, midwives and nurses in different parts of the health service and no-one joins up the dots and sees the warning signs. The 'red-flag' symptoms for women, their families and staff to be aware of are: new thoughts of violent self-harm, sudden onset or rapidly worsening symptoms, and persistent feelings of estrangement from their baby. If you, a member of your family or a friend experiences any of these symptoms, it is important to let your doctor, midwife or nurse know. Similar messages were identified to improve care for women who were victims of domestic violence. All women should be asked about domestic violence, but this does not always happen. Falling through the cracks between multiple agencies is a particular problem for women with social issues or drug and alcohol addiction. These women are particularly vulnerable after pregnancy when care is passed from maternity health services to community services. This vulnerability increases when their baby is taken into care. The message to mothers is that whatever concerns you have, whether they are about your health or your personal situation, it’s okay to tell. The report also contains messages for the future care of women with cancer and those at risk of blood clots, the primary cause of direct deaths.